You live in the city? Well, the safest thing is that the only exterior space you have in your home is a balcony . In fact, it is most likely a balcony with a few square meters. It is not that we are fortune-tellers, it is that it is the most usual in current homes. Of course, although this is the case, you have no excuse not to decorate it. And is that even the narrowest and smallest balconies can look spectacular by adding some decorative details. No matter how small, if you have a balcony at home we recommend that you do not hesitate to decorate it as if it were a small miniature room, because if you optimize it to your liking, during the next months you will be able to enjoy a quality time in the air free without having to leave home. In addition, we are sure that you will love being able to go out to your balcony to have breakfast, to read the newspaper or to drink something at nightfall. To show you what is possible to achieve in a small outdoor space, today we are going to show you a lot of images of charming balconies. In addition, we will take the opportunity to give you some interesting tips and ideas. Would you like to join us? Believe it or not, the options for decorating charming balconies are numerous. Of course, your options will be subject to both the space available and the shape of your balcony. In any case, with a little imagination you will always find useful ideas. To achieve a balcony with style, the most important thing is that you do not leave aside any factor. For example, you should not neglect the soil, which you must choose conscientiously. A good alternative is to cover it with wood , either natural or synthetic. Also, you should know that more and more people are choosing to cover the pavement with artificial turf. And if your floor is deteriorated or you do not like it, you can always cover it with a nice carpet. Of course, remember to choose a model designed for outdoor. If your balcony is very small, it is best to dispense with any piece of furniture. Of course, if you have enough space to put a seat and a small table, we recommend that you do not hesitate to do so. In this sense, a good option is to opt for folding furniture, which will allow you to take full advantage of the square meters. Another alternative is to opt for a hammock or lounger in which to be able to sunbathe and relax. 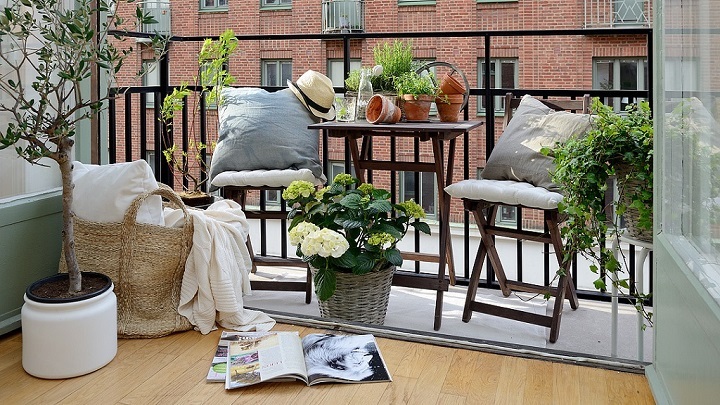 And if your balcony is not very small, you can also choose large benches or chairs accompanied by a low table. Actually, you must choose the pieces depending on the use you are going to give the space. Your balcony will not be complete if you do not add your personal touch. For example, you can add touches of color through the rugs that we mentioned before, the cushions, the vases, the pots, plaids … Of course, if you want a colorful balcony, you can also choose pieces of furniture in bright colors or paint the handrail of a funny hue. Of course, it is also a good idea to add plants and flowers. Finally, we want to remind you that you can not forget the exterior lighting. You can choose to place a lamp on the ceiling or on the wall, as well as more decorative alternatives: garlands, lanterns, candles … Then we leave you with our gallery, where, as we promised at the beginning, we show you a lot of images of charming balconies. Surely they will inspire you when decorating this area of ​​your home.